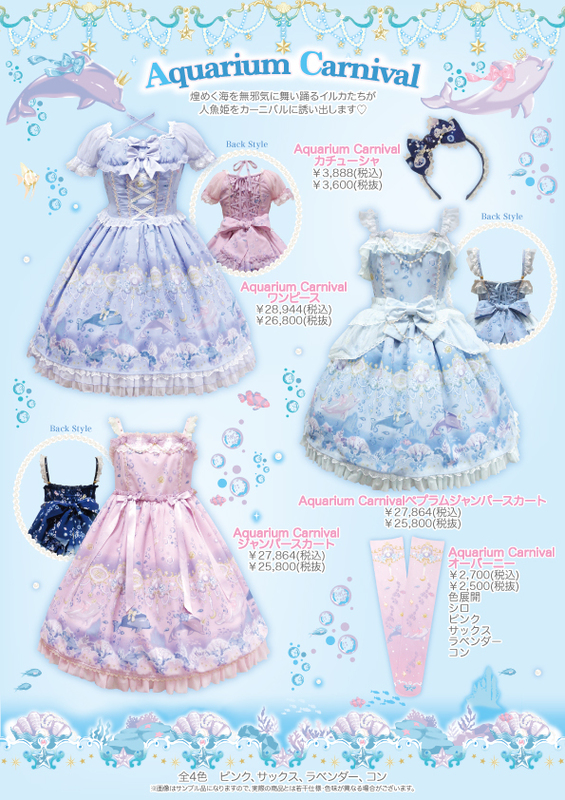 This upcoming weekend Angelic Pretty will finally be releasing 'Aquarium Carnival', one of their very anticipated releases this year! This print is so adorable, why are there not more prints with dolphins? Adding to the cuteness the dolphins have little crowns and ribbons on them. With the marine theme still being really popular this is probably going to be gone in seconds. The cuts for it are pretty standard, nothing super interesting, but I think the print is lovely enough to hold it up. I like the blue colorway the most because it just feels most fitting to the theme. The sheer overlay on one of the jsk's looks a bit off but its usually removable. This is just super cute, can't wait to see amazing coords for it!